At the Lutheran High School Association, we rely on the generosity of alumni, parents, grandparents, friends, corporations and foundations to meet our financial goals. Because of you and with your support, we can continue to be a school of choice that nurtures students spiritually, academically and holistically. Thank you for considering Lutheran North, Lutheran South and the Lutheran High School Association in your charitable giving. Your generosity helps us prepare students for future success and Christian leadership. Cash or credit card gifts are one of the most popular forms of charitable gifts. As the donor, you can deduct the full amount of the contributed cash up to 50 percent of your adjusted gross income. Any excess may be deducted over the five succeeding years, up to the 50 percent annual ceiling, until the gift amount is fully deducted. Gifts of appreciated securities held by the donor for more than one year provide two tax benefits: (1) no capital gains tax is imposed on the “long-term” appreciated gift portion, and (2) the donor is entitled to a charitable deduction equal to the fair market value of the securities on the gift date. Donors over the age of 70 ½ can give up to $100,000 annually directly from their IRA to a charitable organization, such as our Lutheran High School(s), according to current IRS rules. This transfer generates neither taxable income nor a tax deduction, so you still benefit even if you do not itemize your tax deductions. This is a wonderful way for donors to help manage their Minimum Required Distributions each year where those funds would create increased taxable income beyond their needs. A gift of real estate such as commercial property, a residence, a farm, timberland, or undeveloped acreage can provide significant benefits to the Lutheran High School(s) and the donor. A gift of unmortgaged real estate held for more than one year will generate an income tax deduction based on fair market property value at the gift date. The donor is not required to recognize any gain on the transfer. For gifts of real estate valued at $5,000 or more, the donor must obtain a qualified appraisal. Donors who assign ownership of a life insurance policy to the Lutheran High School(s) receive an immediate charitable deduction equal to the lesser of the donor’s basis or the policy’s net cash value. If the donor continues to pay premiums, he or she receives an additional deduction for amounts paid. When ownership of a life insurance policy is transferred gift credit will be given for either the donor’s basis or the cash value of the policy. Donors may arrange for a gift that will ultimately come to the Lutheran High School(s) and retain the income from the gift for life (or the lives of donor and spouse). This is an ideal way to provide for the Lutheran School(s) future without sacrificing investment income and receive significant income, gift and estate tax benefits. Support for the Lutheran High School Association Gala & Auction, Golf Scramble, One In Christ Breakfast, Lutheran High Day at the Ballpark and other events helps raise significant funds in support of our mission and ministry through our Lutheran High Schools. Carneil Kinnie is a Lutheran High School North Class of 2016 graduate headed to college to study economics. During his years at Lutheran North, he was a soft-spoken energetic school leader. But he knows his life may have been very different if not for the support of the Lutheran North staff and students and the generosity of donors. "In 2004 my mother was diagnosed with advanced stage breast cancer. She became terminally ill, and for the next 10 years she was in and out of the hospital undergoing treatment. Despite her challenge, she decided to go back to school to earn her degree. Although this was a difficult challenge for her, she stuck to it, and earned a degree in social work with a specialty in addiction studies. Through this, she instilled the value of education in her eight children. She would always tell us, 'education is the way to a happier life, because knowledge cannot be taken from you. "My mother lost her battle with cancer in the summer of 2014. 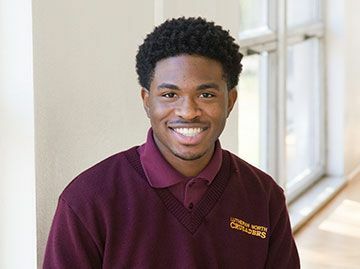 Through the generosity of donors like you, Lutheran North was able to offer financial aid to my brother Clifton, who graduated last spring, and to me. Going on four years now, Lutheran North has been shaping my life. I have had the opportunity to be surrounded by peers who are all striving to be excellent scholars. Our teachers support us and I know they have the love of Christ in their hearts for us."